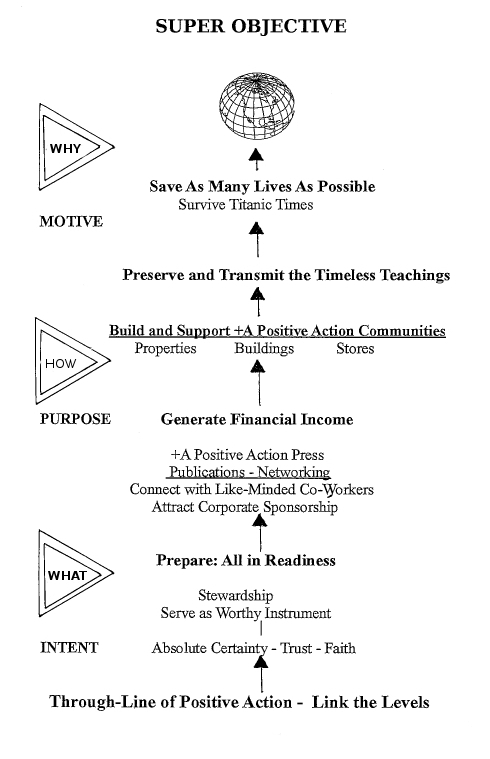 When I originally founded the +A Positive Action Press in the year 1998, I intended to use revenues from publications to build schools and +A Positive Action Intentional Communities. Using a set of 52 iridescent colored pens, I created poster-sized mind maps that detailed its motive, purpose and intent. A humble, summary version is shown here. It uses language borrowed from the acting method taught by Constantin Stanislavski, which I find appropriate to positive action. My personal mind map follows a “Through-Line of Positive Action” aimed towards accomplishing a single Super-Objective: To Save As Many Lives (ultimately, Souls) As Possible. As agents of positive change, it is our responsibility to educate ourselves, prepare, and act with passionate conviction to ensure human survival, one person at a time. Marketing experts speak about the importance of building a platform to get one’s message out to the public. If, as Shakespeare wrote, all the world’s a stage, here the +A Positive Action Press and this website are my platform. The Positive Paradigm of Change is the brand. And you, the honored reader, are the actor who struts the stage during life’s uncertain span questing to create a better tomorrow. Let us work together towards that end. May the force be with us!